Come and join us during Spain GP at Barcelona Private Terminal. Another Successfull Collaboration with Rolls Royce Motor Cars. New Jet International is delighted to announce the opening of its seasonal office in the private aviation terminal of OLBIA - Emerald Coast - Italy. A new representing office will be set to attend and inform the clientele ultil the end of August. As part of our partnership with Rolls-Royce, New Jet will also be present at the Rolls-Royce Studio, Via del Porto Vecchio 1 - Porto Cervo. A drive test will be offered to our clients upon request. Our dedicated team of professionals will be at disposal to satisfy every customer's curiosity and necessity, providing support for any private aviation need with the same quality and service you come to expect of us. 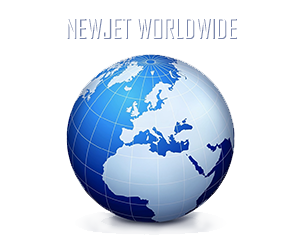 For further information, do not hesitate to contact our team at: marketing@newjet.com or +377 97 70 10 20. MEBA is the most established business aviation event in the Middle East and the biggest event of its kind outside of Europe and North America. With business aviation in the region growing to be worth US$1 billion by 2020, exhibitors and visitors alike are turning to MEBA to take advantage of this growth and build profitable relationships across the industry. New Jet International is pleased to invite you from the 8th to the 10th of December 2014 at the Bombardier Booth #A23 , Dubai World Central (DWC). Ranked as the fourth largest tradeshow in the U.S., NBAA2014 will feature over 1,000 exhibitors showcasing the latest products and services in the industry and nearly 100 side-by-side business aircraft at the static display, confirming itself as one of the world's largest and most important business aviation event. New Jet International is pleased to invite you at the Bombardier Booth #281 , Orange County Convention Center, Orlando, FL. Tuesday, October 21 : 10:00 a.m. – 6:00 p.m.
Wednesday, October 22: 9:00 a.m. – 5:00 p.m.
Thursday, October 23: 9:00 a.m. – 4:00 p.m.
Tuesday, October 21: 9:00 a.m. – 6:00 p.m.
Thursday, October 23: 9:00 a.m. – 3:00 p.m. The Farnborough International Airshow, one of the world's largest exhibitions and air displays, will this year take place from July the 14th until July the 20th. New Jet International is pleased to invite you at the Bombardier Chalet - C3. The European Business Aviation Convention & Exhibition (EBACE) is a premier event and the annual meeting place for the European business aviation community. The exhibition brings together business leaders, government officials, manufacturers, corporate aviation department personnel and all manner of people involved in nearly all aspects of business aviation. New business aircraft firms, avionics firms, handling organizations, fractional providers, charter/lease companies and previously titled aircraft resellers display their wares. This year the Middle East's leading aerospace event will take place at Dubai World Central, located in Jebel Ali - a new home for a new era. We invite you to come and visit us at Bombardier's Chalet # A1-2-3 opened everyday from 09.30 to 17.30. NBAA2013 is the can't-miss business aviation event of the year and the sixth largest tradeshow in the U.S. The key operators and industry leaders will meet in Las Vegas to conduct business, make buying decisions and set the stage for business aviation activity for the year ahead. Attendees, the decision makers in the industry, will spend time on the exhibit floor, meeting and interacting with exhibitors and assessing aircraft and products for future purchases for their companies. Exhibits at NBAA2013, indoor in the Las Vegas Convention Center (LVCC) exhibit halls and on the static display of aircraft at Henderson Executive Airport showcase the world's finest business aircraft, services and products to about 25,000 attendees. What those attendees see at NBAA2013 will influence business aviation purchasing decisions throughout the following year. New Jet International is pleased to invite you to the Monaco Yacht Show 2013 from Wednesday the 25th to Saturday the 28th of September (Open from 10am to 6.30pm). Come visit us at Port Hercules, Booth # QP66 located in the Parvis Piscine. The game has changed! Global 7000 is ready for its first flight! Dassault reported that sales and deliveries of Falcon business jets were down in 2015. Year-over-year net sales of Falcon business jets dropped 72 percent, to 25, while deliveries were off by 10 aircraft from 2014, at 55. Bombardier Business Aircraft Announced today that a Global 6000 aircraft owned andoperated by NetJets, a Berkshire Hathaway company and worldwilde leader in private aviation, set a new standard for speed between three of the world's most challenging airports. On January 28th in London, VistaJet invited selected guests to help celebrate its tenth anniversary at a posh affair in Mayfair. When Thomas Flohr founded VistaJet in 2004 he was determined to redefine private aviation. Bombardier Aerospace announced today that it delivered 238 aircraft during 2013, compared to 233 aircraft deliveries in the previous calendar year ended December 31, 2012. The company also received orders for 388 aircraft, net of cancellations, compared to 481 orders, net of cancellations, for the previous year. Demonstrating Bombardier’s growing importance in the Middle East’s aviation sector, the company will showcase a diversified portfolio of its business and commercial aircraft, its technical expertise and its superior customer support and aircraft maintenance services. Montreal - Bombardier Aerospace today announced the appointment of Éric Martel as President, Bombardier Business Aircraft. Mr. Martel succeeds Steve Ridolfi, who last week was appointed Senior Vice President, Strategy and Mergers and Acquisitions, Bombardier Inc., reporting to Pierre Beaudoin, President and Chief Executive Officer, Bombardier Inc. Both of these appointments are effective January 1, 2014. Making a corporate jet work for an individual or a corporation is all about the math. And we all know that the purchase price of an aircraft is simply the price of entry. Bombardier (Booth No. N5731) announced atNBAA 2013 the launch of its Max maintenance program for Challenger 605, designed to reduce direct maintenance costs to owners and operators and increase dispatch availability by extending required maintenance intervals by as much as 50 percent. The first full flight simulator for Sikorsky's S-76D helicopter has been launched at FlightSafety's Learning Center in West Palm Beach. The new simulator replicates the aircraft's exact flight and operating characteristics, with the aim of bringing high quality training for operators of the S-76D. "This is an important milestone in our Global 6000 jet's history of leadership in Brazil..."